This work is about objects and their makers, their relationship, and the negotiation between tradition and innovation in the creation of things. I explore the relationship between tradition, innovation, and technology as it pertains to the creation, perception, and interaction with acoustic steel string guitars and ethnographies. 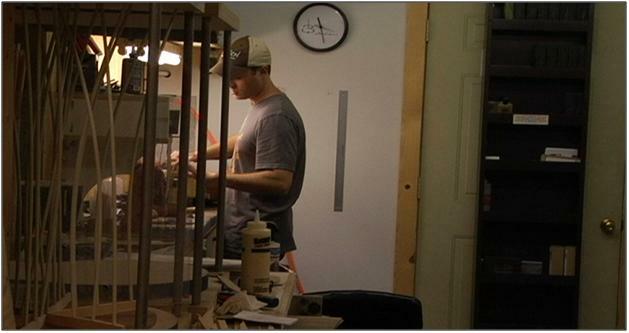 First, I focus on the works of two Nashville based guitar makers, Grant and Cory Batson. I investigate the ways in which the Batsons critically evaluate traditional construction techniques and design features as they create their instruments, looking at their theories of tone production, methods of construction, and their perceptions and uses of various media within their guitars. Second, I recruit the Batsons’ theories, methods, and revisions of tradition as a metaphor to discuss the traditional ways of constructing ethnographic representations. Through this work, I argue for the craftsmanship of more responsive ethnographic things which take into account not only theoretical, but also methodological and media eclecticism. The relationship between a craftsman and the thing created is a complex one. This work, this ethnographic thing, is about objects and their makers. It is about the process of design and the power of precedent, of those choices which shape a practice, a design, or a discipline’s present and future in relation to its past. As a complex act of mediation involving experimentation, risk, and often a critique and revision of the past (Babcock 1993:234), the process of design exists in a state of perpetual fluidity. To be certain, the art of making necessitates mediation. The space between tradition and innovation, the maker and the object, the thing materialized in relation to the traditions of design which predated it, these are amongst a myriad of negotiations taking place within the process of design and fabrication. This work will focus on two acts of creation, that of lutherie, that is, the art of constructing and maintaining stringed musical instruments, and that of ethnographic craftsmanship, the art of making “ethnographic things” (Stoller 1989). Exploring the notions of “responsiveness” and “balance,” central design metaphors circulated amongst contemporary luthiers (C. and G. Batson interview 2009, 2010, Somogyi 2001), I will consider the process of design accretion, revision, and expansion and its relationship with risk, failure, and experimentation. The metaphor of responsiveness is worth serious examination in what it means to be ethnographic, and to make ethnographic things within the twenty-first century. Employing the notion of the ethnographic “design practice” (Rabinow, Marcus, Faubion, and Rees 2008:83) alongside the rhetoric of responsiveness, this work will suggest a rethinking of ethnography as a process of persistent [re]design, an act of canonical, methodological, theoretical, and media boundary maintenance and stressing informed by the power of precedent and anchored by tradition. For most master guitar builders, a successful instrument requires a design which responds to the immense variability found within their craft. Each guitar is understood as a web of potentialities and interconnected relationships to be assessed, accounted for, and worked into the desired tonal and structural qualities by the luthier. This is achieved primarily by balancing three elements; media, which involves critical sensorial engagement and the integration of organic and inorganic construction materials into a singular form which most efficiently transforms kinetic string energy into sonic output; theory, in regards to predicting, shaping, and evaluating tone production in an instrument as a system by understanding the interaction of its constituent parts, and finally, a flexible methodology which builds upon and revises traditionalized design cannon. It is within this mediation and integration of elements that a luthier “balances” an instrument’s numerous tonal and structural variables into a desired tonal profile. 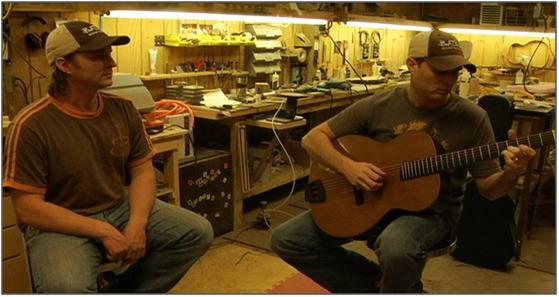 Grant and Cory Batson, brothers, cabinet makers turned master luthiers and self described “practical innovators,” have been building guitars for over thirteen years. Their instruments are unique, innovative, and creatively and critically employ the use of traditional design practices in their quest for the “perfect guitar” (G. Batson interview, 2009). 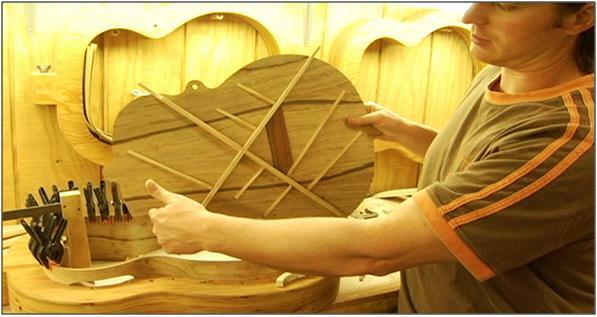 Before an instrument can be formed, however, the design and construction of a Batson guitar begins with the selection, assessment, and paring of tonewoods. After meeting and interviewing their clients, listening to them play, and observing their techniques to determine their tonal preferences, the Batsons search through their extensive collection of tonewoods, matching building media with musician. Cory (left) and Grant (right) Batson playing one of their instruments prior to our interview. Tonewoods, those arboreal media having discrete tone producing characteristics, are the primary material employed within the construction of an acoustic guitar. The neck, back, top, sides and bracing, among other tone producing components are most often made from varieties of spruces, rosewoods, ebony, maples, etc. As an organic compound, no two pieces of tonewood are precisely identical. Guitar tops, or soundboards, cut sequentially from a single log will produce a great deal of tonal as well as structural variation from one soundboard to another. As such, the luthier must become acquainted with their materials, understanding first the broad structural, aesthetic, and tonal properties that exist across the various species or genres of tonewoods, as well as responding to the idiosyncrasies of each piece of wood, adjusting their methods of construction accordingly. Each material is selected in terms of its structural, tonal, and aesthetic characteristics and its aptness to the realization of a particular design situation and must be treated as a discrete and variable entity. mass, etc., are assessed by interacting with each tonewood. Because a luthier can only experience a guitar’s actual tone once it is fully assembled and played, builders theorize about what kind of tone a combination of components might produce. 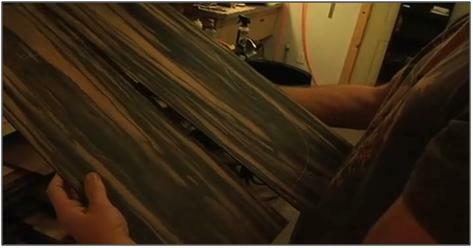 To match tonewoods, Cory and Grant interact with each piece of wood, feeling, flexing, and percussing it and listening to its “tap tone1” (C. Batson interview 2010). Each species of wood will produce a generalized set of tonal signatures. For instance, a piece of Brazilian rosewood will generally produce a long sustained tone with complex overtones and harmonics while maple, on the other hand, would likely yield a short and direct tone with relatively few overtones. Moving in from the general theory of tonewood genres to specific pieces of wood, the builder can begin to determine the best media to employ within a given design. This process of theorizing sound provides Cory and Grant a direction with which to guide their methods of construction. 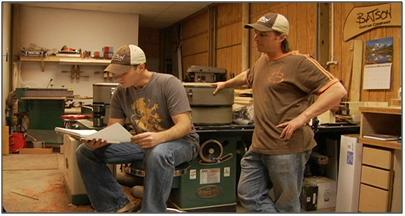 Grant and Cory looking over a list of possible questions and topics that we were to discuss during our interview. (2001). That is to say, that each guitar is understood as a constellation of variables, of potentialities to be worked by the luthier. In the act of material selection, assessment, and integration, the Batsons practice a level of media flexibility and pragmatism. All organic and inorganic media used within a given instrument are figuratively weighed and measured in terms of their aptness, considering what they bring to the instrument structurally, tonally, and aesthetically. That is a very good question. Someone that wants to play a classical [guitar] that has a very heavy hand, I would recommend something along the lines of a cypress for a classical guitar or like a Port Orford cedar or if you could find a good stiff redwood, that would be good, but that would go along with how we actually choose those pieces. Now in general, most redwoods are going to sound like redwood, most cedars are going to sound like cedar, but then when you get to the specifics of what someone’s looking for based on how they play, you would want to go through the material that I have — like if we we’re going to use a Port Orford Cedar, which is probably what I would recommend. It’s soft like a cedar which will kind of balance out the aggressive style, now it depends on what he’s looking for. Someone that does more Chet Atkins kind of stuff I would recommend a rosewood, something more bright, as far as a back and side set is concerned. Just to me, those style players almost to a jazz style of playing they like that bright, full sound, which is what you’re going to get from a more dense side and back set. As far as a soundboard is concerned, sitka spruce always does good for that. “What about for bottleneck (slide) style guitar?” I asked. Starting at the broadest and most generalized level of theorization about sound, Cory and Grant begin by suggesting tonewood species combinations that suit their clients’ needs. Once the builder and the client have selected a particular combination of tonewoods for the back and side set and the soundboard, Cory and Grant move toward identifying individual pieces of wood which exhibit these desired traits most efficiently. The tonal attributes of each piece of wood is ascertained by feeling, bending, and taping the tonewoods in order to better understand their tap tone, that is the ringing tonal qualities produced from a piece of wood when struck by the luthier’s hands. Despite offering their customers options of over 40 different tonewoods for back and side sets and over 14 different tonewoods for soundboards (yielding over 560 possible tonewood combinations, with even further options available upon request), with each individual piece of wood within a given species having its own unique tonal profile and thus associated strengths and weaknesses, every single guitar built in the Batsons’ shop will sound like a Batson guitar. Taylor has a sound. A Taylor sound, Martin has a Martin sound, builders, the more that builder builds and has their construction techniques and method down that’s when it kind of becomes more of an apples to apples comparison, so whereas Taylor might be getting a sound of certain tonewoods a lot of it actually has a lot to do with the construction. Cory: A lot of Martin’s tone and Taylor’s tone, when you hear people talk about the sound of a Taylor, now we do, there are very distinct characteristics of the tone that we get out of our guitars, typically with Martins and Taylors and a lot of other guitars, and to a much less degree Collings guitars, what you’re hearing is the construction of the guitar. You’re hearing the bracing on the inside because there’s so much of it and its stiff and it has to be because of the hole, because of the strings mounted to the top, that’s what you’re hearing and that’s why those guitars sound consistent. You could almost throw a piece of cardboard on there and stiffen it up because you’re hearing the construction of it, you’re not hearing the wood. As far as voicing is concerned, there’s a lot of theory, a lot of debate on how important that is, and actually how much you can affect the outcome of the sound or the tone of a guitar. William Cumpiano, which is one of the most renowned guitar makers, he and Natelson wrote the top selling instructional guitar making book, Guitar Making Tradition and Technology. He believes, and has written, at length, that voicing a guitar is ridiculous. And you have guys like, Dana Bourgeois, who have written equal volumes as to why it is so important. There are as many opinions to voicing a guitar as there are people. I put more effort into selecting the right piece of wood from the beginning, as far as the stiffness of the individual piece. Let’s say, somebody wants an Adirondack soundboard, for like a blues player, they need something stiff, depending on how aggressive they’re playing… The tone that they want, to me, tells me how stiff that soundboard needs to be. I would rather use the stiffness of the actual board as my guide rather than the stiffness of my bracing. I want to do all of the things that I do consistently and let the wood speak for itself. There are some instances where I’ll do a little voicing, I’ll try to take a little piece off here or there, but for the most part, for the I don’t. weaknesses, and strengths. Lattice bracing, for example, typically produces a balanced tonal spectrum across the high, middle, and low frequencies, whereas an X bracing pattern might facilitate more flexibility and thus more low end response. After selecting a bracing pattern, the Batsons work that bracing system to its maximum potential, during which time “the quality of the result is continually at risk during the process of making” (Pye 1968:20). Balancing structure with flexibility, Cory and Grant weaken the structural supports of the acoustic bracing, falling just short of the moment where the instrument’s top would be compromised. This delicate process where the builder removes tiny portions of wood from the bracing structures leaving them tapered, scalloped, and smooth to the touch, is known as voicing. 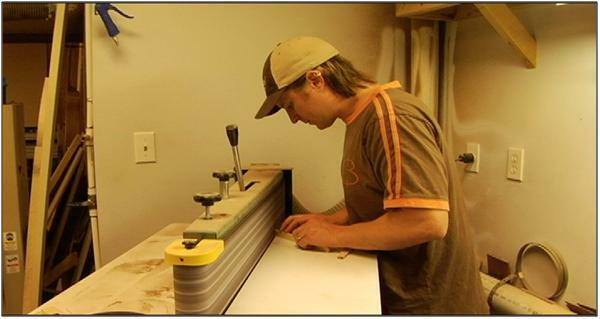 Cory uses a belt sander to reshape bracing patterns, removing large portions of material before glueing them in place on the back or soundboard of an instrument. 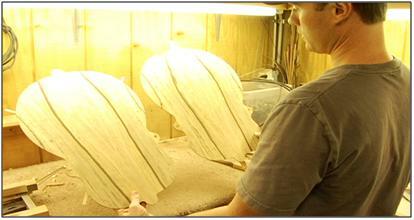 Once the pieces are glued in place and are dry, he then removes more bracing material using more precise hand tools. system which was not tailored dramatically enough to promote maximum flexibility, or conversely, guitars that are under built, wherein the bracing system was excessively weakened resulting in a wonderful sounding but structurally unsound instrument. Those instruments that fall somewhere between these figurative points are said to be most responsive, in that they successfully blend media, method, and theory to solve a particular design problem in the most efficient manner possible. Unlike instruments produced within small numbers like those crafted by the Batsons and other luthiers, commercially produced instruments account for little or no variation within their assembly process, and as a result are, as master luthier Ervin Somogyi describes it, “essentially and literally, random collections of physical variables [and] in consequence, their sound quality will correspond to a statistical bell-curve distribution where a few will be brilliantly successful, a few will be markedly unresponsive, and most will be pretty good” (Somogyi 2001). When I first drove down to Tennessee to see Cory and Grant’s guitars for my initial fieldwork, they were using what they called a “Truss-Brace” system (Batsonguitars.com). It was a fairly typical X bracing pattern, but rather than being made of sculpted solid pieces of spruce, their braces were, much like the trusses used in the construction of a home, hollow in certain areas to allow for both strength and flexibility. The design was extremely unique and was the most radical, but extremely pragmatic, re-creation of the X-brace that I had ever seen. From that time, both Cory and Grant had been trying out new bracing designs and materials, looking for ways to improve the tone of their guitars. Like many expressing a care for the process of design, Grant and Cory, are continually exploring new and test old ways of performing their craft. Grant told me story about a recent venture that Cory had undertaken with a client’s guitar. “It’ll work,” Cory chimed in. Lattice bracing is more typically used on classical guitars and I actually prefer the tone of a classical with lattice bracing but I just wanted to, you know, in keeping with what I do, which is just doing things differently, just to see what happens, as long as it makes a little sense on the front end. I wanted to try lattice bracing on a steel string guitar and, with the other innovations that we do in our guitars, one of the benefits of no soundhole is the ability to manipulate and rearrange bracing without having to work around the soundhole. So, on our guitars, specifically, lattice bracing can be utilized to its fullest extent. Even on a classical guitar the only portion of a lattice braced classical guitar is from the soundhole down. With our guitars, our lattice covers the entire board and the thought process or the scientific physics that’s behind what would make it work is the fact that, with the lattice bracing, you’re getting an equal tension across the entire surface of the soundboard. Which is basically what you’re looking for. Its the same way when you tune a drum head; you tap the drum head about an inch in from each lug and you get all of those points to sound the same, and the goal of what you’re trying to accomplish in doing that is equal tension on the top. It’ll resonate more fully. You’ll get all of the highs, all of the lows, everything in between, plus volume, and that was basically the goal of the lattice bracing. 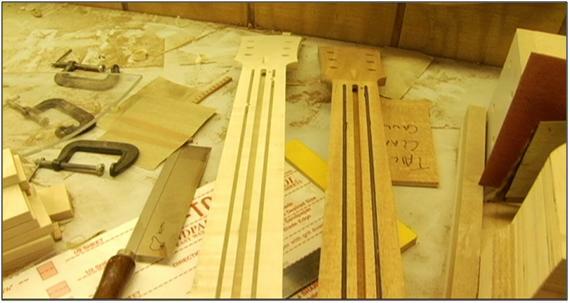 The guitars that have been braced with the lattice bracing have done… Um, two different types of lattice bracing, one is kind of what I would call a reverse scallop bracing, which means the side of the brace that glues to the soundboard is scalloped out so it only touches the soundboard at the cross points. So… we will often find ourselves making a new guitar that we might end up sticking in a closet because we want to try something, and I did that on the last guitar I made for myself. I had this harebrained idea that, you know, Cory had come up with these two bracing patterns that worked really [well], but they were completely different. They both worked really well, there were a few things that we liked about each of them, and I came up with a way to actually make a hybrid using elements of one and elements of the other and make this weird spiderweb shape, almost like a Kasha4 meets, I don’t know. I have used the nomex for a double top and I don’t like it too much. Some people love it, some people love a really bright guitar. I don’t. I don’t really like a bright sounding-bluegrass sounding guitar. If I could play like that I might, but I can’t. But yeah, actually the nomex is one that I tried with really high expectations because I had read so much about people just loving these double tops. 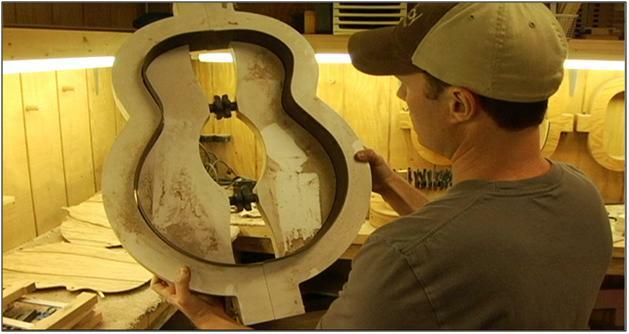 Grant displays a body mold for one of their four original Batson guitar body shapes. 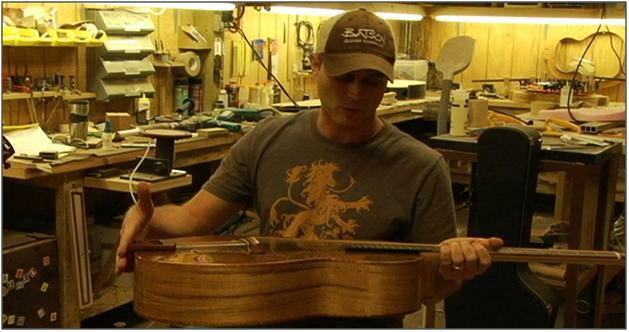 the added benefits of not having a traditional soundhole is the virtually limitless possibilities’ for bracing design (Batson Blog August 17, 2010). These experimentations, some of which are successful while others are failures, eventually, through a process of trail, error, revision, refinement, and finally sedimentation into a their design repertoire. 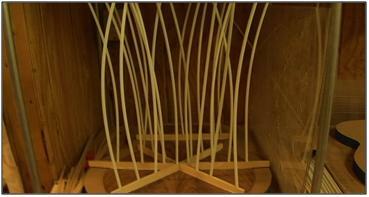 After Cory and Grant theorize and critically evaluate the basic design of a new technique, method, material, or bracing pattern, they build them into existence. Once a guitar is complete, they evaluate its tone, responsiveness, overall volume, etc., and can, if the results are to their liking, begin implementing these new designs into their customers guitars —failures and successes alike bringing progression of form. 2010). The shape of a guitar, being one of the more solidified features. Few builders have drastically experimented with the shape of the acoustic guitar but most efforts, and those few that have pushed the formal boundaries of design have been met with little commercial success. This, as the Batsons and I discussed, brings up the notion of tradition within the building process as both a tool or creative “resource” (G. Batson, interview 2010) while also behaving as a “boundary” of design (C. Batson, interview 2010). When creating something new or simply recreating a traditionalized and well accepted design, one often looks to the past and the achievements of those coming before him or her to evaluate those past ideas, choosing to repeat them without change or to revise and refine them in the process. In the either case, there exists a precedent, a tradition, a part upon which one creative act precipitates another either in kind or in a revisionist manner. Grant: Sounds like a loaded question to me. Well, I mean, anytime that you’re doing something whether its just repeating the same thing or trying to do things to make things better, there has to be a benchmark, there has to be a history, there has to be, you know, something that’s gone on before you, so if you’re repeating the same thing over and over again, then there’s something to repeat, and if you’re trying to make things better well, you have to reflect on the past and go ‘okay, well what was there’ and you have to sort through and pick out the bones and figure out what you want to hang on to and what you want to get rid of. I don’t know that its necessarily a philosophical position that we have about looking at the past and tradition and trying to adapt, but its just a natural thought process, you know. You kind of have to know where you’ve been. You kind of need to know where you’ve been, to see where you’re going. You need to know what works and what doesn’t. Grant: There are a handful of things on our guitars that we could point to old, old instruments and say ‘we didn’t make this up.’ Most of these things we didn’t make up. We pulled things that had traditionally been used and we put them together in kind of a hybrid situation that makes optimal functionality possible for the overall goal which is for the the soundboard to do its job. In that way, tradition has been nice because a lot of people kind of plowed through and did things that worked and we just kind of picked the things that, you know, we didn’t have to recreate a whole bunch of stuff. Grant: You can’t touch that. Cory: You can not change that because what people see and or what people picture in their mind. Grant: People actually in Nashville don’t really consider what we do guitar making because it doesn’t have a hole in the front. ‘That is not a guitar,’ you know, but change the shape, make this an oval or some kind of parallelogram, man we wouldn’t sell one of those things man, well, we might sell one, there are weirdos out there, but I wouldn’t buy one. Cory: Yeah, it is limiting and it is frustrating, but the same reason its limiting and frustrating is because guitars have been around so long that people are so steeped in what is and what makes a guitar. There’s a good side to that too, that guitars have been around so long that everybody knows what they are and a large majority of people around the world know how to play them. . . .
Grant: I think the whole deal with tradition is that if you can keep tradition in the perspective of something that’s useful, its a resource. Tradition is a resource. Its a place to go to look back on, kind of like we were talking about history, but if you make it your paradigm, then that’s when its really going to limit you. If you use it like a resource, like a book or a tool, or whatever, then its very good and helpful. It is this use of tradition whereby Cory and Grant evaluate, revise, and collage both new and old ideas about the acoustic steel string guitar that makes their instruments innovative and so responsive to the idiosyncrasies of their clientele, their materials and methods, and to the current developments within contemporary lutherie community. By looking through traditionalized acoustic guitar designs, techniques, and materials, the Batsons eclectically pick and choose those elements which are beneficial and, as they said, “practical” (G. Batson, interview 2010). Old ideas are not discounted simply because they are old, nor are new ideas instantly deemed apt because they are new. Instead, the Batsons engage in a process of critical evaluation and theorization based upon the specificities of individual tonewoods and their tonal interactions with one another, the client and his or her needs in a custom instrument, and the ways in which all of the techniques and methods available to them, as builders, can be creatively worked to create a better sounding and playing instrument. relationship. Each brace that has been carved to shape its tone, every perfect pairing of tonewoods, these decisions to evaluate the available methods, theories, and materials of construction are a part of the risky behavior of crafting a responsive guitar into existence. techniques like the side sound port or new technologies such as carbon fiber and nomex building materials, while other long established building conventions, tailpieces and cantilevered fingerboards long a part of archtop acoustic instrument and design for example, were tailored to fit their needs. Everything, design features both new and old, were considered as potential sources for improved design. That first guitar and each one built since has functioned as a virtual site for stressing and assessing of the boundaries of design of the acoustic steel string guitar as particular genre of things to create. This ever present risk and the potential for failure as well as innovation is central to the work of not only Grant and Cory Batson but also countless contemporary luthiers exploring the boundaries of their craft. Originally reacting to the poor quality of many commercially produced instruments available in the 1970s, American luthiers began reevaluating the methodologies and aesthetic conventions that had resulted in a traditionalized means of making, “a boundary of design,” as the Batsons once described it (G. and C. Batson interview 2009). Grant explained that traditionally designed acoustic guitars have nearly reached their limits, and that both he and Cory and other like minded contemporary luthiers were testing new ways of building and designs, seeing what works and what doesn’t. Grant and Cory have explored numerous design principles creating new construction features, modified existing models, and have even revisited designs which predate the late 19th century invention of the steel string acoustic guitar itself. Within this experimentation of form we find a quality of risk, a search for responsiveness and balance, a controlled inefficiency which promotes the exploration of design and apt metaphor for the creation of ethnographic things within the twenty-first century. In discussing the state of contemporary ethnographic practice within the 21st century, Tobias Rees noted that the constant assessment and refinement of ethnographic craftsmanship required, beyond all else, that one exhibit “a care about ethnography” (2008:99). One must not only practice ethnography by following precedent, but instead that one must extend beyond deference and replication. Ethnographic things created today should (and indeed they do) exist in a dialogue with canonical texts and prior designs of ethnographic craftsmanship, refining, repeating, validating, or contesting the genealogy of ethnographic knowledge generated through these prior works. Contemporary folklorists’ experiments should be anchored by precedent, but not entirely bound by it. Ethnography is a way of knowing by which “academic knowledge [is] produced” (Pink 2009:8) and as such our ethnographic things must be created with a level of craftsmanship, a controlled inefficiency to ensure that they are not only responsive to the local conditions from which they are formed (in other words, micro-design change) but also to ethnographic precedent and the progression of the ethnographic form on the disciplinary level (macro-design change). Ethnography as both process and product is a collective of potentialities which we ethnographers, like luthiers, must work into responsive wholes5. We experience people, places, the things they make, the things that they believe, traditions and personalities, the objects and concepts of worlds and we commit them to bits of text, pages of books, celluloid, digital content, and so on. The objects of ethnographic study are infinitely variable and, as a result, the ethnographic craftsman must tailor their theory and methods, and by extension, their media of construction to fit continually changing design situations. Ethnographies run the risk of being overbuilt and overdesigned, weighed down by too much theory, too much context, or method, a general insufficiency of flexibility or under built lacking empathy, scholarship, or theoretical insight, in other words structure. Like the luthier, we must understand that our craft is always “workmanship of risk” and never “workmanship of certainty” (Pye 1968:20). From the moment that ethnographic knowledge is rendered within the field to the moment that it is committed to a fixed format within a text, film, or what have you, it exists in a state of uncertainty, it is at risk. Like Cory and Grant’s guitars, we can not fully know if our ethnographic things will work until we make them. We do not know how others will respond to them, how the discipline at large might receive them. “There is now no standard way of doing ethnography” (Pink 2009:8), no “one-size-fits-all model” (Rabinow, Marcus, Faubion, and Rees 2008:12), instead, considering ethnography as a craft of persistent [re]design, we can begin to surmise the importance of risk and the potential of failure within the things that we make. The power of precedent is undeniable, but it is important to remember that works now committed to canon and the established conventions of making ethnographic things were once very new and were, themselves, experiments at risk of failure. Like the Batsons, we should push the boundaries of our craft, to find out if the “design can change” (G. Batson interview 2009). We should ask ourselves: In what ways can it change? Should we change it? How far can we change the “shape” of our ethnographic things before they are no longer ethnographic but are something entirely different? These are the questions of ethnography in the age of hypermodernity6, globalization, and developing digital communicative technologies and we must make ethnographic things which are responsive to these and other conditions. While we explore the boundary of our practice, we should be mindful that these are risky behaviors and that a good design is predicated on trial, failure, and a willingness to experiment. Returning for a moment to the Batsons as a case in point, the process of design is filled with moments of discontinuity and failure. The road to a finely made guitar is paved with the creation of the many failed instruments that came before it. Refining successful elements and discarding those that were found to be unresponsive, the luthier, and indeed, the ethnographer can begin to refashion his or her craft anew with an appreciation and critique of precedent. Grant’s hybrid lattice bracing and Cory’s first venture with a nomex double top, despite their best theories, methods, and efforts, resulted in the creation of instruments with undesired tonal characteristics. The Batsons learned from these experiments, closeted their guitars, and began experimenting anew. With each success, like that of Cory’s recent works with lattice bracing and the solidified design features which now constitute the fundamentals of a Batson designed guitar, the ethnographer’s, and indeed the luthier’s palette is made more complicated. Twenty-first century ethnographers must explore new and revisit old theoretical frameworks, tailor stock methods to fit new contexts, and assess the media with which we choose to build our ethnographic things. As digital technologies have transformed design practices and have enabled new possibilities of creation, digital ethnographic interfaces should be considered for their contribution to responsiveness. What we need is not only theoretical and methodological flexibility and eclecticism, but also a level of flexibility and responsiveness in terms of the media with which we construct our ethnographic things. Though the technology of paper storage media will always remain a central core of ethnographic knowledge production, new modes of communication might facilitate the creation of a different type of ethnographic thing and thus might lead to new genres of ethnographic craftsmanship. Confronted with new media and, in turn, new methods of being ethnographic, its important to remember that ethnographic practice has historically often blurred the lines between audio, video, textual, graphic, and photographic representational media within both public and academic practice alike. From pioneering use of the phonograph by Jesse Walker Fewkes in 1890 (Brady 1999:56), to the use filmic work of Robert J. Flaherty in the 1920s and subsequently, Jean Rouch, Gregory Bateson, Margret Mead, Tim Asch, etc., some years later, to the hypermedia ethnographic works by Jeff Todd Titon. These works are prime examples of the working of various media into ethnographic representations. These are the media of our making and with the influx of digital tablets, E-readers, and online mounted materials, the possibilities of ethnographic storage and dissemination should continue to be tested. We now have the possibility to create fluid multimedia ethnographic assemblages by exploring new technologies and looking to the precedent established by the likes of Alan Howard (1988), Gary Seaman and Homer Williams (1993), David MacDougall (2005), Jeff Todd Titon (1995), and Sarah Pink (2006a, 2006b, and 2009) just to name but a few individuals pushing ethnographic design and craftsmanship towards digital construction. The design of ethnography within the twenty-first century is certain to change as all designs and traditions must. Today, there are more practicing luthiers today than have ever existed in the history of the craft. Looking to precedent and tradition, both historical and present, luthiers like Cory and Grant Batson are changing the contours of their craft. Like luthierie, certainly the same can be said about ethnographic craftsmanship and of folkloristics. With more folklorists, anthropologists, sociologists, and the like exploring the boundaries of ethnographic design than ever before within the history of these disciplines, the shape of ethnography will surely change. As new trends in theory and method, as well as advances in technology allow for the creation of new ethnographic interfaces, perhaps new genres of ethnographic constructions will be made into existence. As with any innovation or progression, there exists a quality of risk, a potential for failure, and ethnography is no exception. Some trends in theory, method, or media might prove fashionable only later to recede while others persist, but it is within those few design elements that prove responsive, useful, that future designs of ethnography will be fashioned. Armitage, John. 2000. Paul Virilio: From Modernism to Hypermodernism and Beyond. Lond: Sage Publications. Augé, Marc. 2009. Non-Places: An Introduction to Supermodernity. London: Verso. Babcock, Barbara. 1993. At Home no Women are Storytellers”: Potteries, Stories, and Politics in Cochiti Pueblo. In Feminist Messages: Coding in Women’s Folk Culture, ed. Joan Radner, pp. 221-248. Urbana: University of Illinois Press. Batson, Cory. 2009. Filmed interview conducted by Matthew Hale. Nashville, Tennessee. 21 October. ________. 2010. Filmed interview conducted by Matthew Hale. Nashville, Tennessee. 24 September. Batson, Grant. 2010. Filmed interview conducted by Matthew Hale. Nashville, Tennessee. 21 October. Batson, Grant and Cory Batson. 2009. A Recent Interview by Good Acoustics. 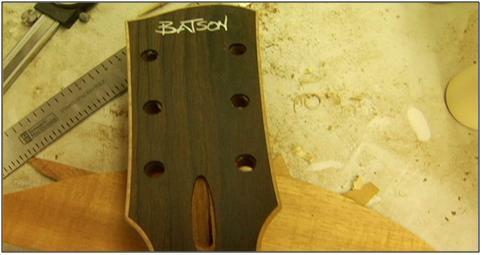 Batson Guitar Company Blog. 17 August. (accessed September 17, 2009). Brady, Erika. 1999. A Spiral Way: How the Phonograph Changed Ethnography. Jackson: University of Mississippi Press. Howard, Alan. 1988. Hypermedia and the Future of Ethnography. Cultural Anthropology 3(3):304-315. Kirby, Alan. 2009. Digimodernism:How New Technologies Dismantle the Postmodern and Reconfigure our Culture. New York: Continuum. Lipovetsky, Gilles. 2005. Hypermodern Times. Cambridge: Polity Press. MacDougall, David. 2005. The Corporeal Image: Film, Ethnography, and the Senses. Princeton: Princeton University Press. Pink, Sarah. 2006a. Doing Visual Ethnography: Images, Media and Representation in Research. Second Edition. London: Sage Publications. _______. 2006b.The Future of Visual Anthropology: Engaging the Senses. London: Routledge. _______. 2009. 9000000000000o8i. London: Oliver’s Yard. Pye, David. 1968. The Nature and Art of Workmanship. London: Cambridge University Press. Rabinow, Paul, George Marcus, James Faubion, and Tobias Rees. 2008. Designs of an Anthropology of the Contemporary. Durham: Duke University Press. Randy Renyolds Guitars. 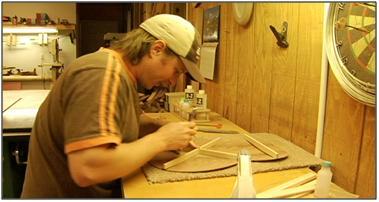 2010. http://www.reynoldsguitars.com/dtop/shtml (accessed October 18, 2010). Seaman, Gary and Homer Williams. 1992. Hypermedia in Ethnography. In Film as Ethnography, ed. Peter Ian Crawford and David Turton, pp. 300-311. Manchester: Manchester University Press. Somogyi, Ervin. 2001. The State of the Contemporary Guitar, Part 4. Fingerstyle Guitar Magazine. Stoller, Paul. 1989. The Taste of Ethnographic Things: The Senses in Anthropology. Philadelphia: University of Philadelphia Press. Titon, Jeff Todd. 2003. Text. In Eight Words for the Study of Expressive Culture, ed. Burt Feintuch, pp. 69-98. Urbana: University of Illinois Press. Tylor, Edward Burnett. 1871. Primitive Culture:Researches into the Development of Mythology, Philosophy, Religion, Language, Art, and Custom. London: Bradbury, Evans, and Co. Printers, Whitefriars. 1 The tap tone of an instrument (typically a procedure implemented on soundboards) is determined by holding a piece of tone wood between a thumb and finger at the periphery of the piece of tonewood with one hand. With the hand, the luthier will percuss the wood forcing the wood into vibrate, exciting the material and thus causing it to produce an audible ringing tone. Tap tuning, as it is called, allows the builder to understand some of the tonal and structural characteristics of their materials. 2 Travis style, thumbpicking, Kentucky Thumbpicking, or thumbstyle guitar is a particular style of playing the guitar which involves complex polyphonic alternating bass lines and melodies that are simultaneously played employing a thumbpick on the picking hand. This style originated within western Kentucky and is associated with players like Merle Travis, Mose Rager, Eddie Pennington, Chet Atkins, etc. 3 Action refers to the distance between the strings to the fretting hand playing surface. The closer the strings are to the playing surface on the fretboard of the guitar, the easier it is to fret. Instruments said to have high action have a greater distance between the strings to the fingerboard playing surface. Conversely, instruments said to have low action have less distance between the strings to the fingerboard playing surface. Each type of action (which is more of a continuum rather than a dichotomy) has specific benefits and weaknesses for particular playing styles and preferences. 4 A style of bracing developed by Dr. Michael Kasha, a biochemist from Florida State University, who proposed an entirely new style of acoustic bracing pattern which does not resemble any of the traditionalized designs. 5 By the phrase “whole” I mean to refer to an ethnographic thing which is seen as a complete work rather than calling to mind Sir Edward Burnett Tylor’s notion of the “complex whole” (1871). 6 Hypermodernity or supermodernity, (sometimes referred to as post-postmodernity or post-postmodernism) is a descriptive term(s) employed to describe a set of socio-cultural conditions seen in art, architecture, music, literature, theory, etc., which is seen as a reaction to the constellation of characteristics of the conditions of postmodernism. For instance, reactions to the eclecticism and skepticism of postmodern ethnographic theory, the dismantling or de-subscription to metanarratives, the recognition of the constructedness of ethnographic texts and their literary form, a tendency toward self-referentiality, a preoccupation with surfaces rather than modernity-like depth concentration — “immanence and indeterminacy,” to borrow from Ihab Hassan’s “Toward a Concept of Postmodernism,” and so on and so forth. Though glossing over the notion of postmodernity, hypermodernity is a reaction to the continuation of the conditions of postmodernity as well as modernity. See the works of Gilles Lipovetsky (2005), Marc Augé (2009), Paul Virilio- see Armitage (2000), Kirby (2009), etc. Matt Hale is a dual PhD student in Folklore and Communication and Culture at Indiana University, Bloomington. He earned both his B.A. in Anthropology and M.A. in Folk Studies from Western Kentucky University. He was the recipient of the Outstanding Graduate of Anthropology (2008), the Cam Collins Outstanding Undergraduate (2008) and Graduate (2010) Award, the Potter College of Arts and Letters Award (2011), and the Warren Roberts Prize for for Best Student Paper in Folk Art Prize (2011) which he received for the above paper. His current research focuses on the “illocutionary force,” performativity, and corporeal iterability of steampunk costuming, wherein he explores this expressive form as a means of social critique of late consumer capitalism, technological and sartorial homogeneity, and unsustainable human practices. His research interests are: historical consciousness, time and temporality, body art and adornment, narrative theory, material/narratolgical discourse/dialogism, and the history, theory, and production of ethnographic film. Previous Thomas Burton. Beech Mountain Man: The Memoirs of Ronda Lee Hicks. the ready made design pattern at your will. provide feedback and let me know if this is taking place to them too? We couldn’t find anything on our end that could be causing this problem; you may want to check through your settings.